A Blast of a Birthday! Ahem, well, yes…this is one of the rare times you will ever see a photograph of me here on this blog. Not so much due to any false modesty, but because I’d rather DRAW the image than merely post the photo. But somehow I loved this pic taken during my birthday celebration at our home. My parents, my neighbor and dear friend Joann, came over for a delectable meal my husband cooked for us. My mom & dad brought their ukuleles, my daughters got theirs out to play, and I had just received my kala kiwi. The photo is a bit blurry perhaps owing to my not being able to contain the giggles! The evening was supercalifragilisticexpialidocious!!! You’ve gotta join the fun! These ukuleles are way fun! P.S. 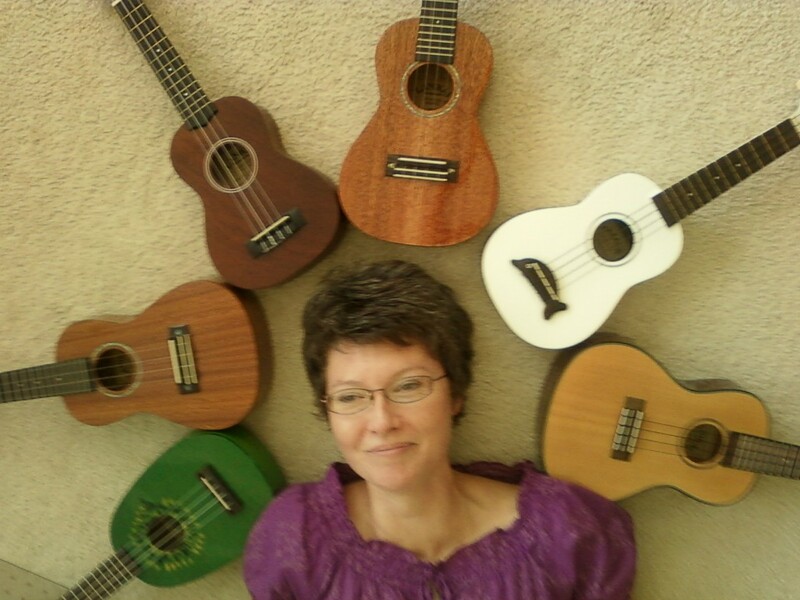 In case you’re wondering…the ukuleles from left to right: my new Kala Kiwi, my Lanikai LSM-C, my oldest daughter’s Lanikai LU-11, my mom’s Lanikai LSM-C, my yougest daughter’s Kala Dolphin, and my dad’s Spruce Top concert. Missing from the array is a tiny sopranino my dad failed to bring along with him…the nerve! P.P.S. And in case you’re wondering why the drawing AND the photo?? Someone asked (I think it might have been Deborah), a few posts ago (here), if I make these drawings of myself from memory or from photos? Most of the time it is from photos. The more cartoony ones, like here and here, are just out of my head. With a photo, I begin a continuous line(s) drawing at some random point on the photo and follow the contours fairly quickly eyeballing distances and perspectives. The drawings never turn out exactly like the photos, sometimes, quite different. But I usually allow them to just “be”. There are times when I will simply begin again on a fresh page of my sketchbook, if I feel the drawing has totally gotten out of control. Then, for color, I may or may not stick to the “local color” found in the photo…it’s whatever I think it needs in that moment. The birthday really looks like a blast, and Ukelele are definitely fun, especially when so many people are playing them! I think there are other names for this light, summery, fruity cake: you use a box of yellow cake mix that has mandarin oranges and pineapple mixed in it. The icing is made of French vanilla pudding with cool whip and crushed pineapple also. Then it is chilled in the fridge…yum! Perhaps you’ve had it before, just not by that name:) Thanks for commenting Nancy! What a rousing chorus! Happy birthday! 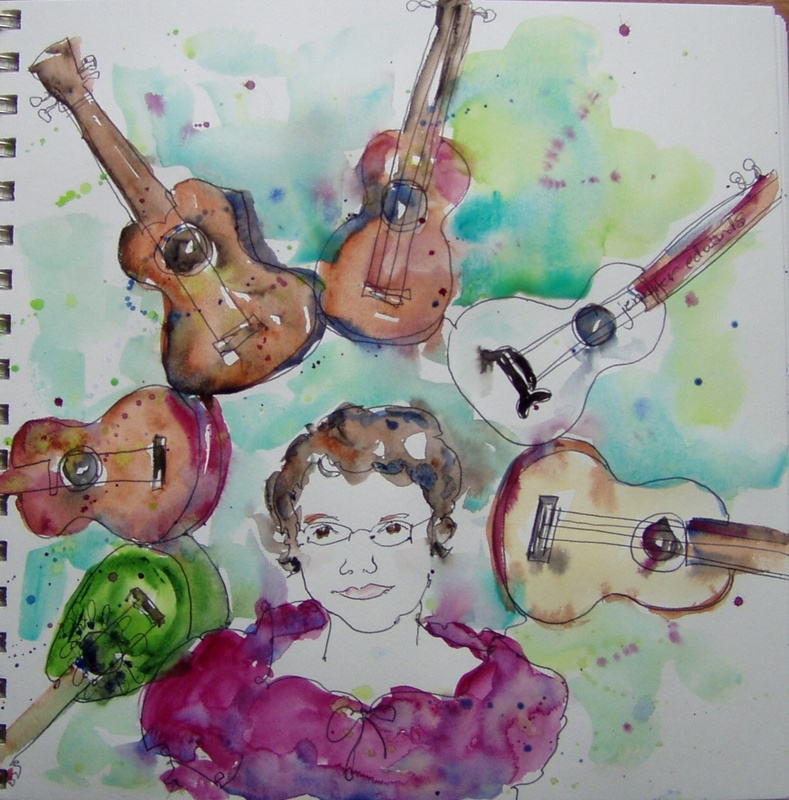 Ha ha, it was fun to hear the ukuleles, and your self portrait is great, oh, and happy birthday! Happy birthday Jennifer! 🙂 Love your shirt! Happy Birthday! Wonderful sketch, but I’m wondering the same thing as Nancy! What is a ‘pig picking’ cake? Best I can do without a ukulele!